Robert Harrison earned All-Ohio honors two years at Toledo Woodward High School where he was All-City three times. He captained the University of Michigan squad for two years and made All-Big Ten and All-American twice before turning pro. Harrison received an outstanding student-athlete award. He played for the Minneapolis Lakers (1949-54), St. Louis Hawks (1954-56) and Syracuse Nationals (1956-58), winning four world championships. He was named an NBA All-Star in 1955. After his professional career, he coached basketball, soccer and tennis at Kenyon College (1958-68) and was head basketball coach at Harvard University for six years (1968-74). 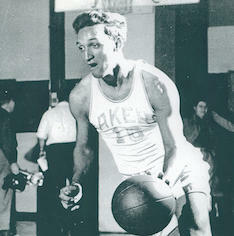 One of his players at Kenyon was John Rinka, a member of the inaugural Ohio Basketball Hall of Fame Class in 2006. Harrison served as president of the Ivy League Basketball Coaches Association.